Ausroad’s experience and technical expertise in hiring Road Maintenance Trucks ensures your hiring experience will be productive and trouble free. Our reputation as an expert in the field has developed over many years of building successful relationships with our valued hiring customers. We have many long term and repeat hiring customers and look forward to assisting new ones. 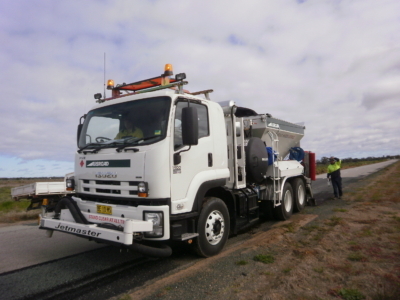 Ausroad® has a fleet of Jetmaster® Road Maintenance units currently available for hire. Ausroad® can deliver the units to any part of Australia and we provide full training and backup support. Ausroad can supply dry and wet hire rates on request. Able to be operated by single operator from cab. Even distribution of aggregate and complete control from cab. Full training and backup support provided. 6 cubic meter unit mounted on an Isuzu FVZ cab chassis. The unit has a broom, spreader box, paver, full width spray bar and remote control front patching boom. Want to find out more or get a quote? Ausroad® designs, manufactures and hires purpose-built, specialist Road Maintenance and Stemming Machines for both private and public sectors. Customers include government departments, local councils, private contractors and mining and resource companies.